Description: The Little People Copter Rig includes a truck, trailor, helicopter, and more! This is the only set that used a special snap-on helicopter landing pad. The pad keeps the helicopter attached to the trailor when en route. This pad is also the most hard to find piece in this set. The Copter Rig's sister set, the #345 Boat Rig, also includes a snap-on pad, but it is shaped differently to accomodate the boat. 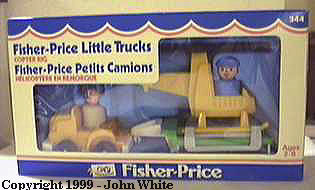 FPT492 - Green 1-seat truck wth a white front grill, white bottom, and white bumpers. The truck has a hole on the back to attach/pull a trailer. The truck rolls on 4 knobby wheels. FPT433 - Green top, White base flat-bed trailer. Rolls on 2 "knobby" wheels and has a hitch on the front. FPT434 - Grey square snap-on helicopter holder / Landing Pad (snaps onto the set's flatbed trailer). The top center has a large round imprint design of a compass. FPT807 - Yellow top, YELLOW bottom 1-seat slim "box-style" helicopter with yellow landing gear, and black propeller (2 rotor blades). The rotor blades have NO marking. AFPP - Tall blue pilot, smiling, wearing a blue pilot's cap with a M-shape above the bill. ECPP - Tall tan construction worker with a silver construction worker, an orange scarf, and no moustache. *See Variations below. EEPP - The tan construction worker could have also had a moustache opposed to no moustache. FP344BOX1981 (Box ONLY) - This set was sold in a 11-1/8" long, 6-1/4" high, 3-1/4" deep display box. FP344SET1981 - MINT in Box Set - WFL: 07-AF-04-2-C. This set was also available in other countries, French version shown in photo.